This turtle has the coolest ride in town - at least until he heals fully. 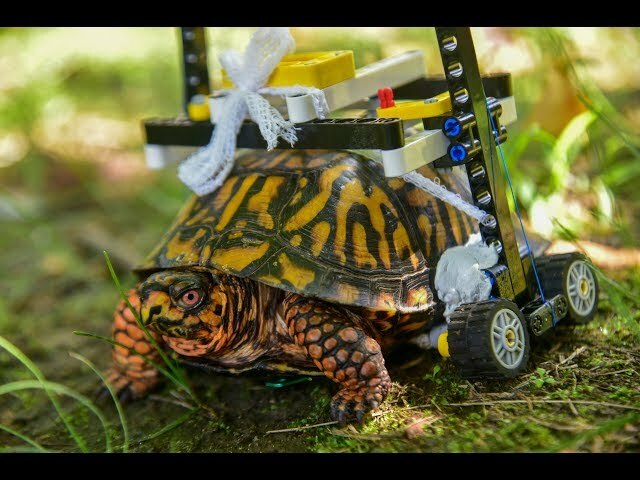 An injured wild Eastern box turtle recently discovered by a Maryland zoo employee has now been fitted with a tiny customised wheelchair made of Legos. According to Maryland Zoo, the turtle was found with a severely fractured shell. "It was important to keep the bottom of the shell off the ground so it could heal properly," says Garrett Fraess, veterinary extern at the Zoo. "They don't make turtle-sized wheelchairs. So, we drew some sketches of a customized wheelchair and I sent them to a friend who is a Lego enthusiast." The sketches proved successful, and two weeks after his surgery, the turtle was gifted a customised wheelchair made of Legos. "He never even hesitated," said Mr Fraess. "He took off and has been doing great. Turtles are really good at healing as long as the shell remains stable." According to Maryland Zoo, the turtle is likely to use his new wheelchair all through winters and spring, since the recovery process is slow. "Turtles heal much slower than mammals and birds, since their metabolism is slower," explains Dr Ellen Bronson of Maryland Zoo. "We are very happy that he is recovering well from his injuries and we plan to return him to the wild once he is fully healed."